Weight Loss and Management and many others. Case may vary from one individual to another depending on the extent and severity of an issue. However our disclaimer stands still, we don't claim to heal, treat or cure any of the above mentioned or will be mentioned. We work closely with doctors and professionals to give our residents the best life they can have and enjoy it to the fullest. We also don't charge extra for any of our programs, Its just an added benefit to our clients.  Residents on oxygen; among others. Prices will vary depending on the resident's level of care and needs. 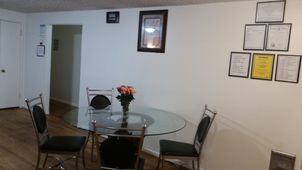 Residents are also welcomed to bring in furniture of their choice if they want to.